In the last few years, however, I’ve made it no secret that I’ve somewhat turned away from SCTs and to refractors for a variety of reasons. What gives? Am I now fer ‘em or agin’ ‘em? Answer? It’s complicated. In fact, just about everything concerning the SCT is complicated except for its relatively simple design (other than that dratted corrector). Moreso than any other telescope it raises strong emotions. It doesn’t just have fans and skeptics, it has lovers and enemies. It’s unusual to see a general discussion of the SCT online on BBSes like Cloudy Nights that doesn’t degenerate into slings and arrows from both sides. That being so, I thought this Sunday we’d go over the arguments of both the prosecution and defense in the Curious Case of the SCT: Is it a Good Telescope or Not? The Schmidt Cassegrain is just naturally easy to transport and set up given its folded optics and short tube. The C8 packs two meters of focal length into an OTA less than two feet long. Carrying around and mounting an 8-inch f/10 Newtonian is something of a nightmare, but an 8-inch f/10 SCT is practically a grab ‘n go scope, to summon that overused cliché. A modern fork mount model is virtually a self-contained observatory. Not only is there goto, computerized pointing, to the tune of tens of thousands of objects, some models now feature built in auto-guiding, wi-fi, and can align themselves with little user intervention. An 8-inch SCT, a battery, maybe a DSLR, a box of eyepieces and you are ready for either visual or imaging work at the drop of a hat. The most amazing thing about SCTs? They’ve gotten cheaper. 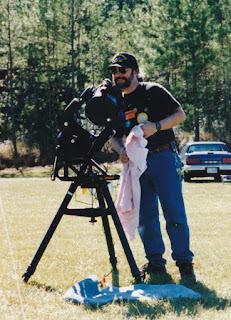 Back in the day, in 1995, I paid over two-thousand dollars for my Ultima 8 SCT. It was a nice enough telescope with very good—if not perfect—optics and a sturdy fork mount and tripod. However, there was no goto or other computerization. The mount was powered by a 9-volt battery. Turn it on and the telescope tracked, turn it off and it stopped. It did have a Periodic Error Correction (PEC) feature, but when you turned the scope off at the end of the night, your hard-won PEC “recording” was lost and you had to re-do PEC all over again the next evening. Otherwise? There wasn’t even an auto-guide port. Today, 1500 bucks in our decidedly smaller dollars will get you a Meade LX90, a very competent SCT with a sturdy-enough mount and tripod and a hand control with zillions of objects. If you can bump the budget up to 2700 George Washingtons, you can have an LX200 GPS, a telescope that doesn’t just include just about every conceivable computer feature, but which has a mount at least comparable to that of my old Ultima’s massive fork. Oh, and the LX has a much better-looking field edge than the Ultima 8’s thanks to the telescope’s ACF, “Advanced Coma Free” optics. While I haven’t done the computation, the LX200’s current price is still likely less in real dollars than what I paid for that manual telescope in '95. I’m not just talking about the dreaded Halley-scopes, the SCTs produced during the comet Halley craze, when I say Schmidt Cassegrain optics could be variable in the past. There were some excellent ones, but there were also some dogs. The good news is that both companies are very consistent today. There may be fewer stand-out scopes, but there are also far fewer poor ones. Add to that advances like Celestron’s Edge optics which reduce coma and field curvature, and Meade’s ACF optics, which reduce coma (and which are available in f/8), and it’s no exaggeration to say that in general terms SCT optics are better than they ever were. Thanks to features like the moving mirror focusing system dreamt up by the man who invented the commercial SCT in the 1960s, Celestron’s founder Tom Johnson, few telescopes are so suited to such a wide variety of tasks. You can take high resolution pictures of Jupiter one night, observe deep sky objects the next, and do spectroscopy of distant galaxies the evening after that. It’s not just that the moving mirror focusing gives the SCT tremendous a back focus range that will accommodate eyepieces, cameras, and other sensors of all types, it’s that it has become the PC or telescopes. The SCT has been around in commercial form for over 50 years, and both companies have more or less retained the standards Celestron implemented in the 70s. 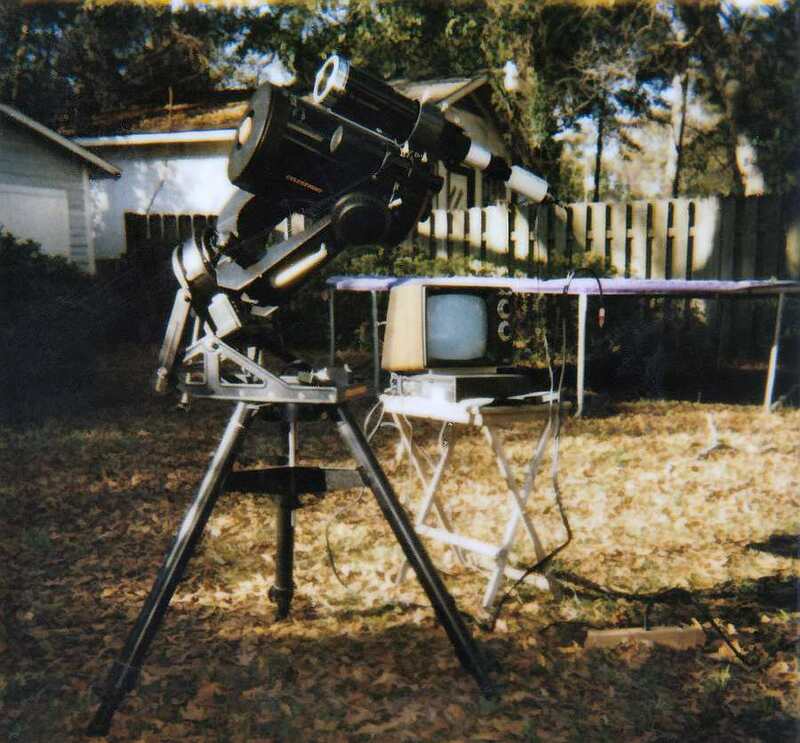 A visual back from the mid-1980s will still screw on to any modern Meade or Celestron SCT. That means there’s a huge number of accessories and add-ons for these scopes. Those many accessories include focal reducers and extenders (Barlows), and thanks to the Schmidt Cassegrain’s focus range, it’s easy to make these things work on the telescope for visual or imaging use. Most SCTs are natively f/10 telescopes, but just a few dollars gets you extenders and reducers that give you an f/20 and an f/6.3 too. It’s like having three telescopes for the price of one. When some new innovation is developed, it’s usually developed for SCTs first. 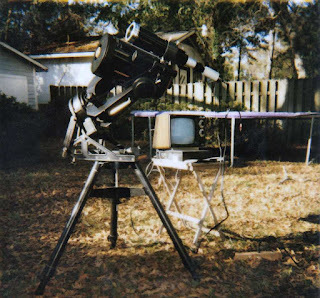 When goto came to commercial amateur scopes, it came in the form of the Celestron Compustar and Meade LX200 SCTs first. If you want the latest and the greatest—like Meade’s Starlock System, which provides integrated guiding and goto—look for it in Schmidt Cassegrains and especially fork-mount SCTs first. Why? In part because Meade and Celestron SCTs are still the most popular commercial telescope. The numbers keep the prices down despite ever increasing (electronic) features. An impetus to this innovation is the fact that you’ve got two companies competing for one small market. It’s like Honda and Toyota—the two keep innovating and adding more features in hopes of pulling ahead of the competition. Certainly, smaller SCTs are quite portable, but not quite as portable as they’re often said to be. If you don’t mind carrying a telescope out in at least two pieces and assembling it, a 5 to 8-inch SCT is portable. However, even A C5 stretches the idea of grab ‘n go. Oh, some people might pick one up in one piece and waltz it into the backyard, but it’s more of a handful than you’d think. Most Fork mount C8s? Few of us would want to carry one more than a few feet. A fully assembled C8 on a GEM, even on one of the relatively light CG5/VX/Exos size mounts? No way, not unless you are the incredible Hulk. Get above 8-inches, especially with fork mount models, and even “transportable” becomes dicey. A 10 – 12-inch fork SCT OTA/fork/drivebase will weigh in at around 50 to 70 pounds. Even when setting up in alt-azimuth mode, more than a few people will be challenged. You’ll have to lift that awkward tube/fork/drivebase combo onto a tripod at least waist high and get it oriented on and bolted to said tripod. Onto a wedge’s tilt-plate for use in equatorial mode? At the 10-inch level that is sometimes a job for two, and at 11 and 12-inches it most assuredly is. The biggest CATs, the 14s and 16s, are telescopes for permanent or semi-permanent installations where you can at least wheel scope out of storage and onto an observing pad. How about a GEM, then? A 10-inch isn’t bad. At 11-inches, however, many normal adults will be stressed. It’s not so much the weight as it is the awkward bulk that has to be held steady as the dovetail is slid into or tipped into the mount’s saddle. A 12-inch is entering the realm of scary for most, and a 14-inch—which is like wrestling with a full garbage can—is a daunting task. Mounting a 16-inch is a serious undertaking for at least two men. SCTs in smaller sizes are transportable and convenient, but as aperture increases, they become surprisingly less portable than some other designs. 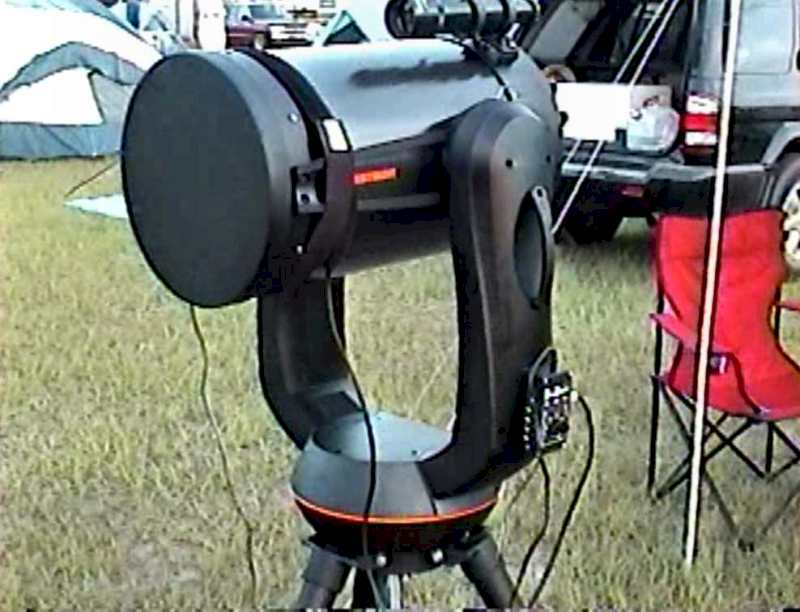 Today there are 20-inch (ultra-light) Dobsonians that are far more portable than a 12-inch LX200. There is no denying Meade and Celestron Schmidt Cassegrains are supremely affordable considering their apertures and features, but there is a reason they are cheap. While both companies have thousands of satisfied customers, the road to satisfaction is sometimes a rocky one. One of the reasons SCTs are inexpensive is that they are made and sold in (relatively) large numbers. Another, more concerning, reason is the Chinese companies’ QA programs are not exactly robust. Even scarier is that some of the materials and parts used in these telescopes are of lower quality than they should be. A case in point was Meade’s much heralded RCX400. The one I used (loaned me by a Meade rep at a star party) worked well and had some amazing features. I did note the fit and finish was rather poor even for a mass produced SCT, especially given its 4000 dollar plus price tag. Internally, it turned out, the story was even worse. Many of the telescopes arrived DOA, often thanks to the inexpensive motors Meade used in the focusing and collimation system—and that was just the tip of the iceberg. While the RCX is an extreme example, the same sort of thing, the same low-balling of parts and lax QA, is evident all across Meade's and Celestron’s product lines. Wise advice? Don’t be an early adopter of one of the companies’ scopes. While both do tend to get their products right, it often takes a while—that “while” extending even to “years.” If you get a DOA SCT and have to ship it back to your dealer or the maker, or if your scope develops continuing problems, it may not seem like such a bargain after all. Both companies have come a long way since the 1980s and early 1990s when it comes to optical quality. And, certainly, credit where credit is due for them introducing improved designs like the Edge and ACF. However, SCT optics with their 30% range central obstructions will always be a compromise. Their contrast characteristics are never going to be as good as those of unobstructed or minimally obstructed scopes. Also, thanks to their mass-produced nature, these days you will likely get good optics but you will rarely—if ever—get great optics. Surprisingly, both companies produce great refractor optics and often excellent MCT optics. It seems SCTs are just a little more difficult to get to that level, and it appears they always will be. The SCT is indeed good at many things, but there are often other designs that are better at any one of those things. If you are an astro-dilettante like Uncle Rod, that may not matter, but if you have a special interest area in our avocation, it might. 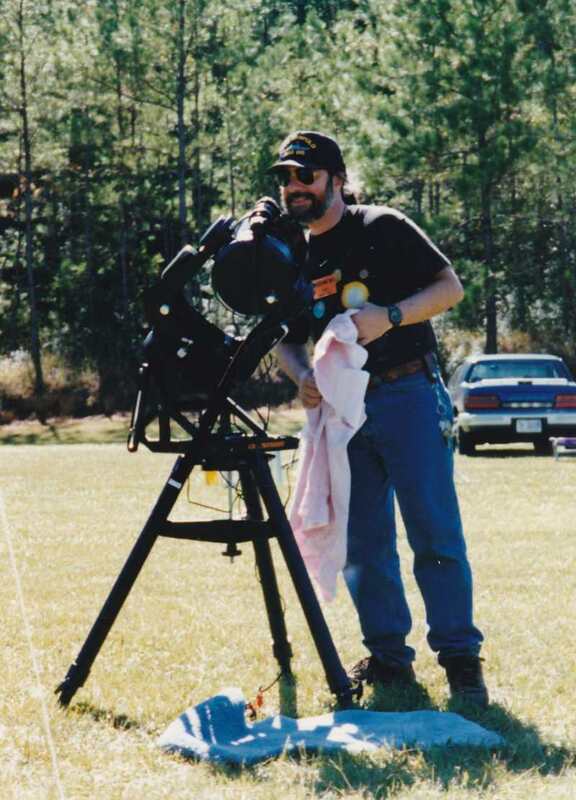 A Newtonian or a refractor, for example, is a better instrument for planetary observing. 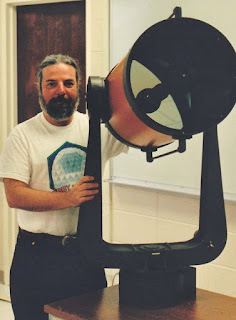 A large and portable Dobsonian is better for visual deep sky work. A refractor, an APO refractor, is arguably a better choice for deep sky astrophotography (although an SCT can certainly shine when it comes to imaging small DSOs or planets). Being able to control focus and collimate the telescope with the hand control sounded great when the RCX400 was announced, but, as above, it didn’t work out to anyone’s satisfaction. Given the price arena Meade and Celestron play in, sometimes the tech just won’t work right given the money M&C have to develop and implement it. Goto on both brands is pretty rock solid now, but, still, sometimes simpler is better, or more dependable anyway. That is up to you. I’ll let you make up your minds about it and would love to hear your decisions in the comments section. Me? These days I am perhaps not quite the Schmidt Cassegrain evangelical I once was, but I still use them. My stable may have shrunk to a single C8 (my Edge 800) and a C11 (whose days may be numbered), but, yeah, I still use ‘em. When I do pull my C8, Emma Peel, out of her case, it’s like coming home. I know, Mr. Wolfe said you can’t go home again, and that is somewhat true. I am more aware of the design’s warts than I used to be (or would admit), but I still believe “right tool for the right job,” and that right tool is still sometimes the good old Schmidt Cassegrain.